Paul Mason is not your childhood’s Santa Claus. He is the original Fashion Santa, though! The Canadian-born model, with well-groomed white beard and taste for natty attire, became an instant sensation the second his stylish Kris Kringle-looks went viral a few years back. With exclusive rights to the “brand” he created, Mason is ringing in this holiday season with loads of public appearances. 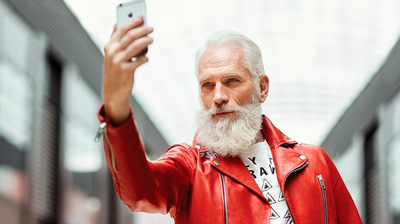 In addition to modelling and brand work (he’s spent over three decades on fashion runways), the dashing 55-year-old Father Christmas is available for corporate and special event bookings, posing handsomely with guests for selfies or at a photo station. He also works year-round which makes for some creatively fun event options. Like the other jolly dude, philanthropic causes are near and dear to his heart, such as anchoring this December’s first annual Not So Silent Night in support of SickKids, or working with events willing to donate selfie proceeds to a charitable cause. Friendly and approachable, the Toronto-based Mason is all smiles and twinkly blue eyes: “I’m Santa’s younger brother… the one who watched his weight.” LOL!